Everglades National Park has the largest protected, contiguous mangrove forest in the Northern Hemisphere. Ecologically significant, mangroves provide habitat for arboreal, tidal and subtidal life forms, nesting sites, cover and foraging areas for birds, habitat for some reptiles and mammals and protected nurseries for fish, crustaceans and shellfish. 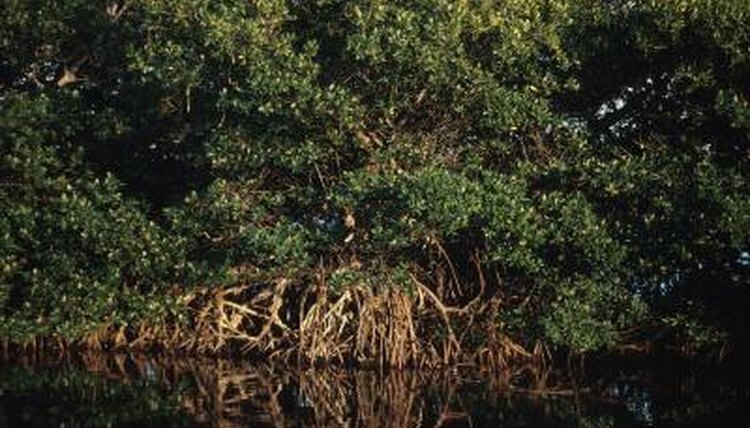 Mangroves supply important rookeries and nesting areas for birds. The threatened white-crowned pigeon requires undisturbed mangrove forests for nesting, as do the tricolored heron, little blue heron and snowy egret. Shorebirds that forage on mudflats around mangroves include the threatened least tern, black skimmer and American oystercatcher. Birds of prey that use mangroves as foraging perches and resting areas include the osprey, bald eagle, peregrine falcon, kingfisher, double-crested cormorant and several varieties of hawks. Although amphibians are poorly adapted to the brackish water of mangrove habitats, five amphibian species utilize the mangrove forests of the Everglades for feeding and breeding, primarily the tree frog and marine toad. A total of 24 species of reptiles live in the mangrove forest and its surrounding waters, including threatened species such as the Atlantic salt marsh snake and eastern indigo snake, the American alligator, the endangered American crocodile, the green anole and the mangrove terrapin. Turtles seen in the area include the loggerhead and green sea turtle. Mangroves and the species supported by them often provide sustenance for predators, which can be found foraging for food in and around the mangrove forests. The Florida black bear likes the large, undisturbed expanses of mangroves and has been known to swim between mangrove islands searching for food. The Everglades mink hunts at night in the mangrove swamps, searching for reptiles, small mammals, birds, frogs, fish and eggs on which to feed. The highly endangered and rare Florida panther stalks prey in mangrove habitats, including the Key deer. A total of 18 mammal species live in the Everglades mangroves, including the rice rat and Lower Keys rabbit. A total of 220 fish species rely upon the habitats provided by the mangroves' unique root systems for nurseries. The fish that swim and spawn in mangrove habitats provide a food source for larger sport fish such as snapper, tarpon, jack, oyster and shrimp, directly supporting the fishing economy. The most dominant fish species swimming in the mangrove forest basins are the mosquito fish, least killfish and sailfin molly, but other species include the common snook and the threatened Key silverside. The mangrove rivulus can only be found in and around mangrove areas, and is the only species of rivulus found in North America.